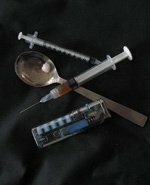 Heroin: Signs and Symptoms of Abuse. Heroin can be injected, snorted, smoked or taken orally. Depending on the method used, effects are felt from as quickly as 3 - 5 seconds up to an hour for oral ingestion. Body temperature low or below normal. Can cause death due to respiratory failure. If this drug is used in a different setting from the normal one, the user can overdose on an amount that was previously tolerated. This drug can be mixed with many different things making it hard to judge the exact dose a user is getting. Any injected drugs leave the user open to risk of infection and blood borne diseases.